Push button operation Allows you to easily pour up to 4 oz. of coffee or tea per pump. 10-cup capacity Lets you make enough coffee for a group. Brew-through assembly Permits simple brewing without the need to remove the pump. Glass insulation Helps keep your beverage hot for hours. Chrome finish with black trim For an attractive appearance. 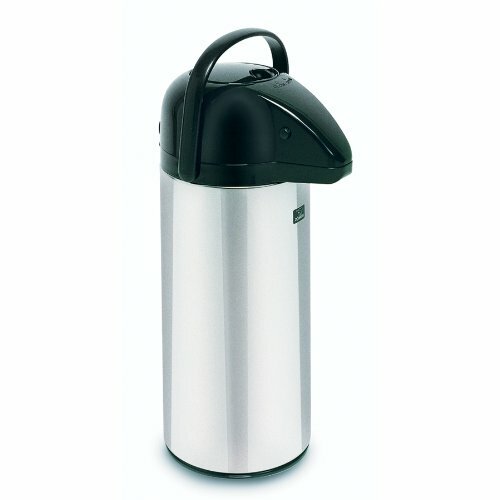 The BUNN 13041 2-1/2-Liter Push-Button Airpot Coffee/Tea Dispenser is a great way to keep hot beverages like coffee and tea at the right temperature for your enjoyment. Just close the lid after brewing and it dispenses up to 4 ounces at the first pump. It comes complete with a brew-through insert, glass insulation to keep beverages hot for hours, and attractive chrome finish with black trim design.